Friday night is pizza night at our house. Over the last year, I have chosen to abstain and prepare something simple and healthy for myself, without worrying about whether or not anyone else will like it. I wake up feeling more energized, and everyone is happy with his or her meal. Last Friday night, I worked with what I had on hand, trying to use some of my CSA items. I split and roasted the acorn squash with a little honey and butter in a hot oven for about 45 minutes. I sautéed a tiny shallot, and some finely shredded kale in a little olive oil, and lightly browned some pignoli nuts in the pan. 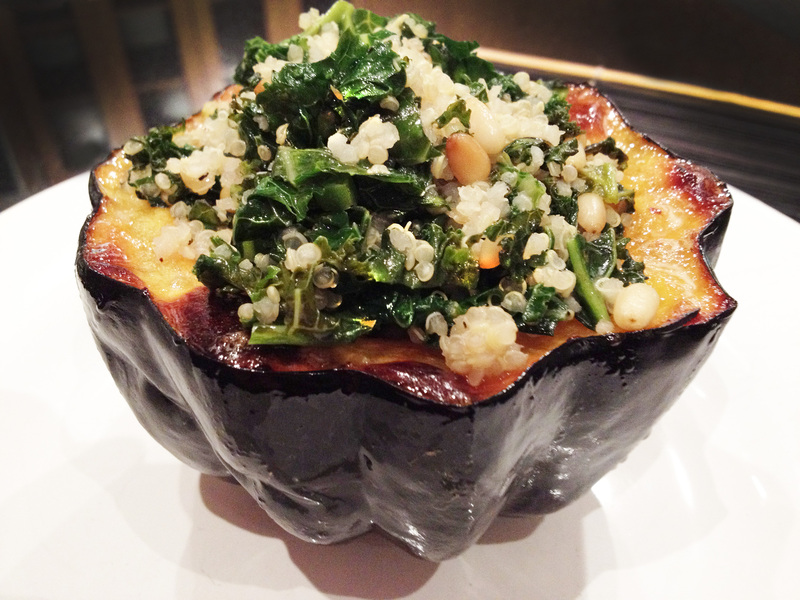 I tossed the vegetables with some quinoa cooked in stock and stuffed it into the cooked squash cavity. You can toss in a few dried cranberries for a sweet and colorful pop. A sprinkling of black pepper and a little chopped parsley provided a finishing touch. Easy, healthy and flavorful! The stuffed squash a nice glass of red wine were the perfect early fall meal. I have now used the squash, kale, lettuce, kohlrabi, and a little of the parsley. The pineapple sage did not survive the night. I just have the collards and parsley left to go. What shall I do with it? First Lady Michelle Obama has done considerable work to help fight the battle of childhood obesity and instill the concept of healthy eating in young people across the country. As a result of this, school lunches have been limited to 850 calories, and kids across America are complaining it’s not enough. According to various university researchers, teenage boys require between 1,800 and 3,200 calories per day. Girls need 1,600-2,400 calories per day. This range is contingent on body composition and activity levels. It seems that the issue is not really calorie restriction. It is the quality of the food being served. It is important to note that most fruits and vegetables, low fat dairy, fish, poultry and lean cuts of meat are relatively low in calories. An 850-calorie lunch, consisting of fresh, healthy food would likely be more than most growing kids would be able to consume in any given meal. A group of high school students in Kansas have put together a protest video, set to the tune of “We Are Young” by F.U.N. and retitled it “We Are Hungry.” The video claims that the lunches are not sufficient to provide the energy needed to participate in sports. It shows kids sneaking off to fill up on fast foods and processed snacks to give them more sustenance to get through the day. Once again, the point has been missed. Any athlete will tell you that high calorie, high fat, high sugar, processed foods are not the key to performance, and often make people feel sluggish after eating them. Providing fresh and healthy “real foods” are the key to controlling weight and energy levels. Educating youth on proper nutrition, and giving them the right foods to help make healthy choices is a better idea. Overalls are making a comeback next spring,with feminine iterations seen all over the catwalks. Soft, feminine versions take the work wear staple to another level. Kinder Aggugini showed silk floral printed overalls with a charming gingham blouse. Henry Holland showed a lace trimmed floral version for his House of Holland collection. Phillip Lim took an edgier approach in bold colors worn bare, with a striped cover-up and ankle boots. Somehow, I found myself with lots of parsley this week. I had purchased more than I needed for cooking, and then I got a huge bunch in my CSA selection. 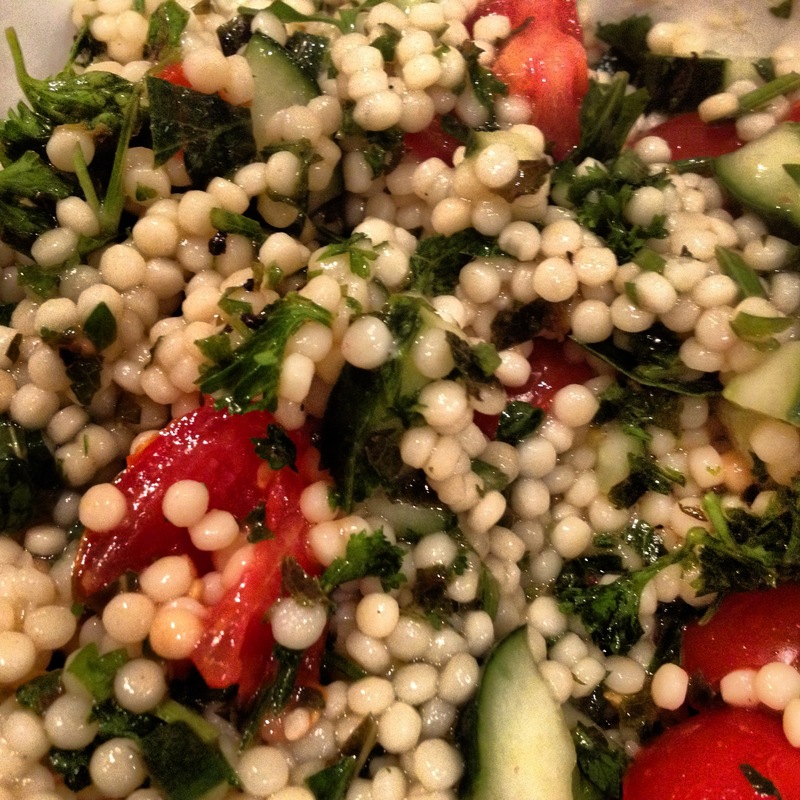 When life gives you parsley, make tabbouleh! 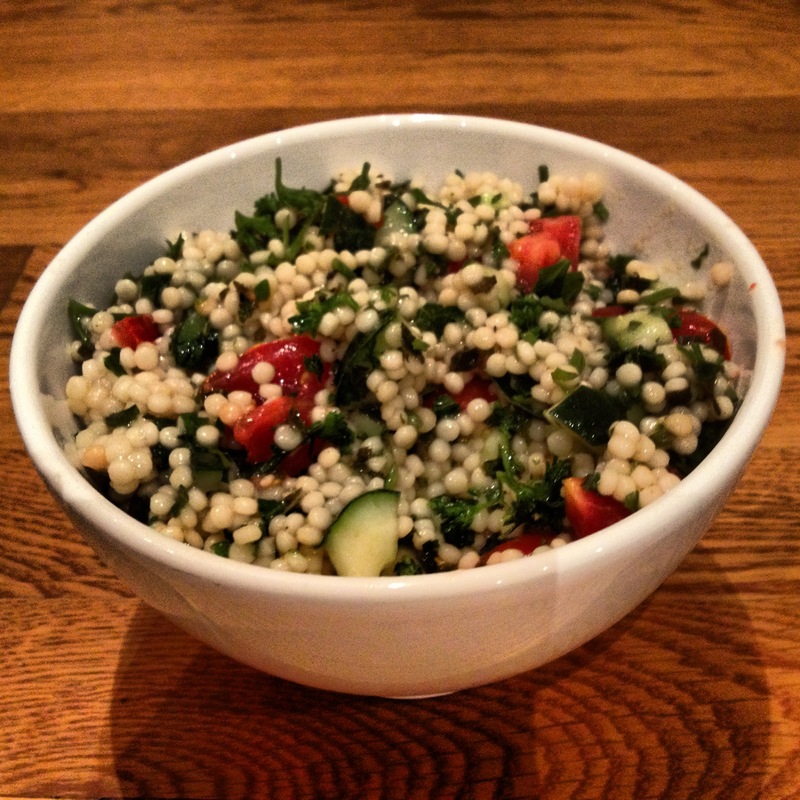 Tabbouleh is a Middle Eastern dish, made from bulgur wheat, with copious amounts of parsley and fresh mint, tomato and cucumber. Of course, I can never leave well enough alone, and had to make a classic dish my own. I also didn’t have any bulgur available, so couscous seemed close enough to get the point across. Substituting Israeli couscous (a much larger “grain” than regular couscous) gave the dish a whole new texture. And since Israel is in the right geographical vicinity, I thought, why not? Boil stock or water in a pan and add the Israeli couscous. Turn off the heat, cover it, and allow the liquid to absorb for about 5 minutes or so. Toss with a fork and place it in a large bowl. As a rule of thumb, use twice the amount of liquid as dried couscous. Chop 1 bunch of parsley leaves, and one bunch of fresh mint leaves. Mix into the couscous. Add the juice of 2 or 3 lemons, and a healthy dose of olive oil. Mix well, and allow the flavors to mingle for a while before serving. This is a great make-ahead dish, as the longer it sits, the more the flavors blend. Check the seasonings before serving and enjoy! As he wound up his monologue, he stared right at me. Coincidence? Probably, but it threw me for a loop just the same. This particular teacher is known for his “show no mercy” attitude and pushing you beyond your limits. I leave class physically drained, soaking wet, and proud of my accomplishments. I push myself, (with his help) pretty hard. He doesn’t generally come by to check up on me, or increase my resistance. I might have just been in his line of vision as he was addressing a packed room. Or, he might have singled me out silently to let me know I needed to up my game. Whether or not he did, the effect was the same. 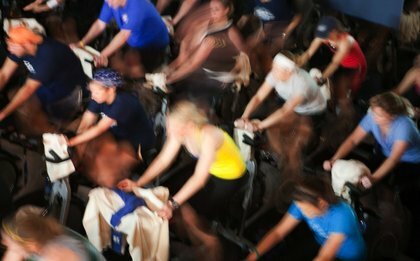 The next day, thighs still tight from the above-mentioned class, I got on the treadmill. Almost immediately, my left quad cramped and my hamstrings started screaming at me to stop. Did I, you may be asking? Hell no! I pushed through 4 miles absorbed in the experience of intense discomfort. All I could think about was my cycling teacher’s glare. I powered through my workout with his words motivating me to keep going. Later, after spending some quality time with a foam roller and a hot bath, I walked to work as usual. I had a few stops along the way, and didn’t bother to change my shoes. On the way home, I kept thinking about “the comment” again, and wondered if he could have walked 3 miles in 41/2 “ heels. That would teach him about pushing through the feeling of discomfort, wouldn’t it? Of course I could just go up and ask him if he was addressing me specifically, or if it was just a coincidence. But I don’t really need to know the answer. His comment somehow ignited some competitive flame inside me, and is serving its intended purpose, even if it really wasn’t intended for me! 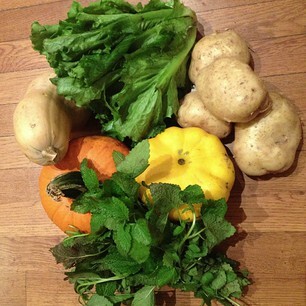 Today’s CSA bounty was very different from last week’s haul. 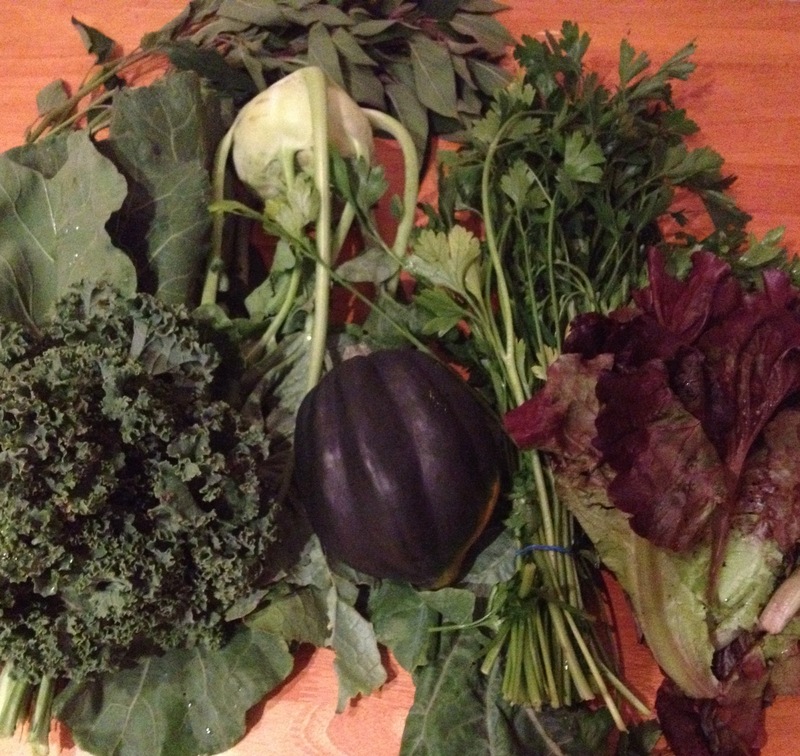 There are lots of greens, including lettuce, collards, kale, parsley, sage, and kohlrabi. An lonely acorn squash rounded out the assortment. With one family member who grew up in the South and remembers over-cooked collard greens simmered in leftover, and possibly rancid bacon grease, and another that only eats green items like gummy worms and M&M’s, this selection is going to be a challenge. And I LOVE a good cooking challenge! Stay tuned. 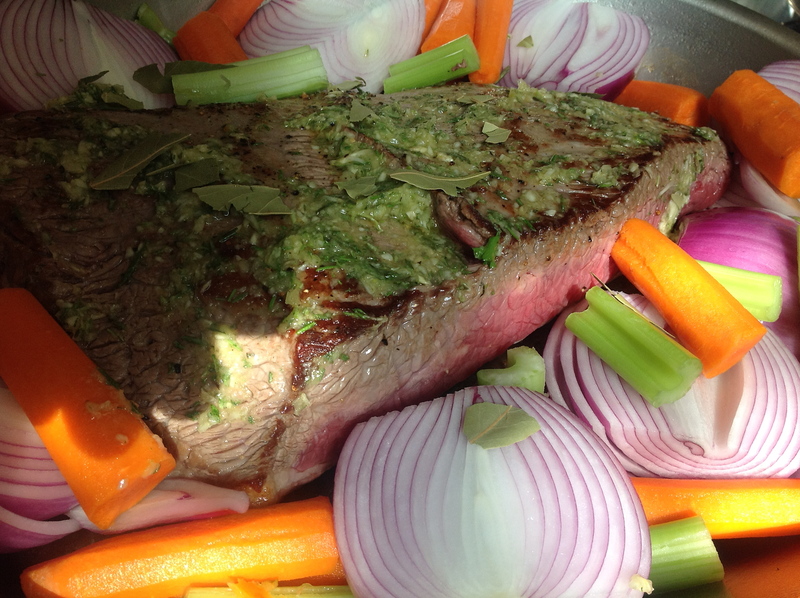 This week indigo jones is going green and sharing the unrecipes along the way! Wish me luck! New York designers are showing their stripes next season, with a fresh, innovative twist on the classics. Bold stripes appeared in lean languid shapes or easy menswear silhouettes. The most notable American designers embraced the trend, with dresses, tops and suits all earning their stripes! Marc Jacobs is arguably the most directional designer in the world right now, and all eyes were on his collection, as editors looked for the next big thing. After seasons of excess, his Spring ’13 collection highlighted clean graphic interpretations of the 1060’s, while channelling the iconic Edie Sedgewick. Tommy Hilfiger is synonymous with all-American style. His collection featured classic and deconstructed stripes in easy feminine takes on menswear. Michael Kors also played the stripe card, with bold sailor stripes on clean modern shapes. As you are packing away the last of your summer wardrobe and getting ready for fall, hold on to that boat neck striped tee for one more year. It is sure to be the center piece of your wardrobe next spring. Why does Jewish “comfort food” leave me so uncomfortable? Last night marked the start of Rosh Hashanah, the Jewish New Year. As always, it is celebrated with way too much heavy food! I spent the whole day in the kitchen preparing for our big meal. We started our feast with chicken soup, accompanied by both fluffy matzoh balls and kreplach; a meat-filled dumpling that goes into the soup. Ours featured chicken and was a big hit! It was followed by a gratuitous salad that nobody ate but me, and a brisket roasted with tomatoes,onions, carrots, celery and red wine. 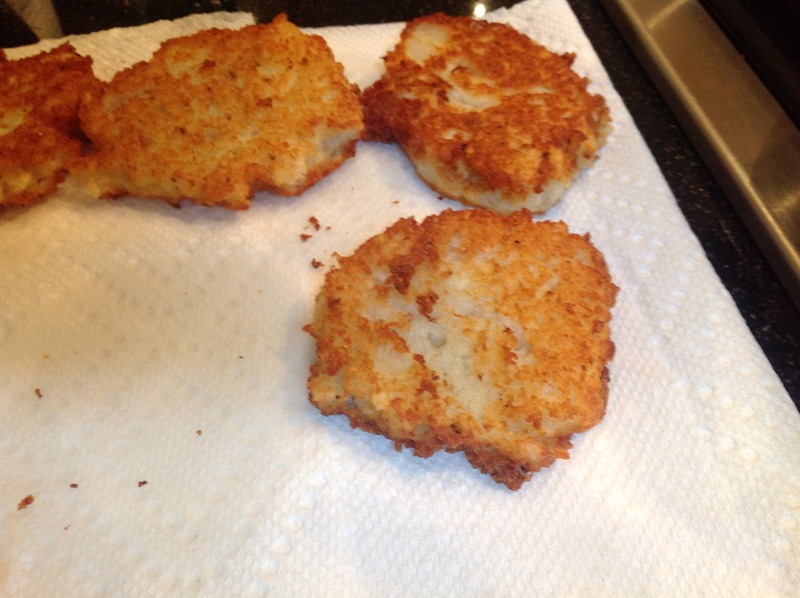 We had potato pancakes with homemade applesauce as a side dish and a traditional challah bread. 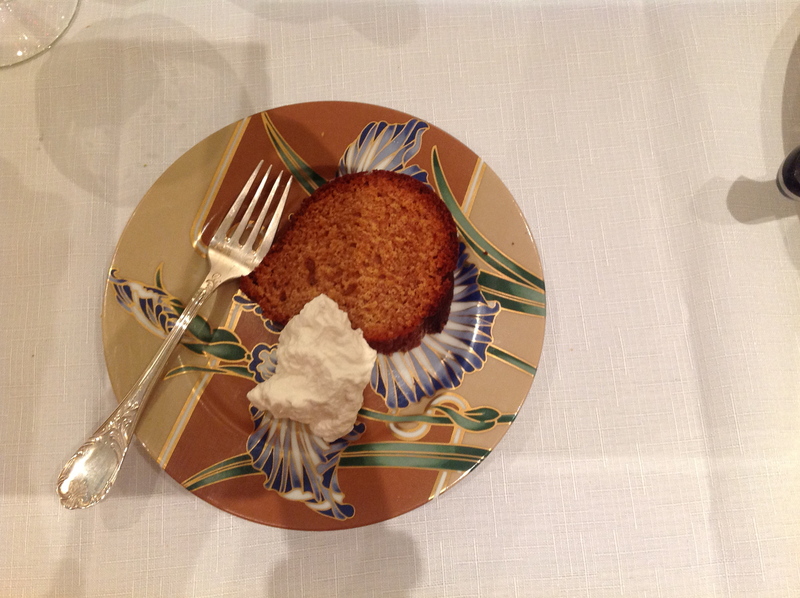 For dessert, there was a honey cake with fresh whipped cream. I skipped all the meat, but filled up on more carbs at one meal than I generally eat for a whole month, or two! That and a little (okay,more than just a little) red wine, has left me stuffed to the gills. Happy New Year everyone! Wishing you all a happy, healthy and prosperous year ahead!